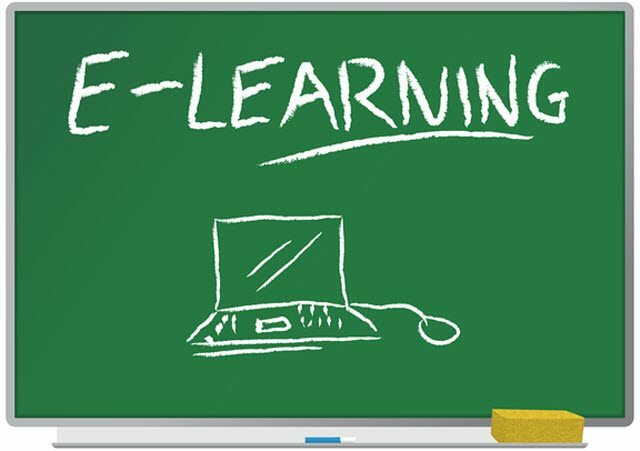 Elearning is described as the delivery of training or education through digital or electronic methods. Learners can acquire qualifications or develop new skills using electronic devices. Devices such as a laptop, mobile device or tablet. Learners access educational material often delivered through a learning management system (LMS). This is hosted online. An online training course can be delivered in multiple formats. Formats that include the most basic PowerPoint presentation, as well as PDF documents. Also, advanced interactive slides. Slides designed using special elearning software. The levels of interactivity in elearning can vary considerably. Some courses simply have a set of slides for the learner to scroll through. Others can be more interactive. They may include clickable elements, activities, or games. They may have drag and drop features as well as quizzes and assessments. These may be presented at different times, as the learner progresses through the course. With the ongoing development of the internet, elearning technologies continue to advance. And, the way in which learners learn also continues to evolve. Before the internet existed, distance learning courses were available. But the process of studying was demanding. Both in terms of resources and time. Course materials and assignments would have to be printed out and sent to learners. Learners would study the material and then send assignments to their instructors through the mail. Distance learning can be traced far back into history. In the 1840s Isaac Pitman delivered a correspondence course, teaching shorthand. Shorthand is a form of writing using symbols instead of words. This system improves the speed at which professionals such as secretaries or journalists can take down notes. As a qualified instructor, Pitman taught learners entirely through distance learning. Assignments would be sent through the mail to learners. In return, he would send the next section of work until the course was complete. The first machine used for testing was developed in 1924. By 1954, a ‘teaching machine’ was invented by BF Skinner, a professor from Harvard. This machine let educational establishments deliver programmed education to their learners. Yet the first computer based program for teaching wasn’t introduced until 1960. This new system was called PLATO. PLATO was originally intended for learners who were studying at the University of Illinois. But it was also used in many schools in the local area. These initial systems were designed to provide information to learners. It wasn’t until the 1970s that the learning experiences began to incorporate more interactivity. The Open University, now a prominent institution in the eLearning world, became interested in this new method of learning. In The Open University's early days, course materials would be printed and mailed to learners. Course interactions took place by correspondence between learners and tutors. When the internet came along, this changed everything. This transformed the way that learners could communicate with learning providers. And, vice versa. In the late 20th century, the computer and the internet was created. This advanced elearning methods and tools considerably. In the 1980s the first MAC computer was released. This enabled individuals to have a computer at home. This made the entire process of learning much easier. In the decades that followed, virtual learning environments were created. These environments enabled learners to access dedicated web portals and communities. There they could learn about almost any subject. And, they could secure qualifications in the process. By the early 1990s, courses could be delivered online. This gave everyone access to education. Even those who could not attend a college or university because of other commitments. By the 2000s, businesses adopted eLearning as an innovative way to educate their employees. eLearning provided new ways to deliver corporate training. Many employers used it as a strategy to improve the skill set of employees. And, to help employees expand their industry knowledge. These courses could be accessed from anywhere at any time. All that was required was a simple login to their online learning portal. Once logged in, employees could access all of the course material. They could also submit assignments and communicate with other learners who were studying the same course. Accessibility: There are no restrictions when it comes to studying through elearning. Learners can access course material at any time of the day or night. Many face-to-face courses are very restrictive. They require learners to attend a certain venue at a specific time. To get a degree, regular classroom attendance may be required for years at a time. But with eLearning, courses can be accessed directly online. Course material can be studied from work, at home, or on the daily commute. For businesses, allowing employees to study through distance learning reduces disruptions to their schedule. And, this also saves the cost of booking training venues, as well as other related fees. Cost Efficient: An eLearning program for employees is much more cost effective for businesses. There's no need to send employees to a specialist training venue or educational facility. Employees spend less time physically away from the office. This also means reduced travel costs. But that's not all. Required course materials are issued online. This saves printing costs as well. Online learning helps businesses save enormous resources, while at the same time, improving productivity. More Effective Learning Experience: eLearning makes absorbing information easier. Doing that is harder in a classroom lecture. eLearning uses a selection of tools and techniques. It combines video, audio, activities and written material. Depending on the nature of the course, a range of learning content types can be incorporated. An elearning curriculum can be tailored to the learning requirements of each learner. This helps learners to retain and use the information they learn. Through eLearning, a variety of useful instructional techniques and methods are available. These can provide an engaging elearning experience for the learner. In addition, frequent learner interaction is encouraged. This helps to maintain attention and enhance the learning experience. A key method for achieving a high level of interaction is called scenario based learning. eLearning makes it easy to use the most effective training methods. Another effective method is a personalized learning experience. Self Paced Elearning: Here's one of the great advantages of eLearning. Learners can study at their own pace. Time is a premium. One of the key advantage of elearning is that it offers quicker delivery than a traditional, classroom based course. eLearning reduces training time. Because it is easier to start or conclude the training, learners can complete the course at their own pace. Travel time is no longer required to attend venues. Venues which can be many miles away. Learners can therefore focus on specific elements of the course. Elements that they need to learn in detail. eLearning gives learners greater flexibility and control. Such benefits cannot be provided in traditional classroom learning. No Need To Travel: For some learners, time is a critical issue. Classroom learning can present scheduling conflicts. Many do not enroll in courses because they can't attend the classes. Or, they don't have the time required to travel to the venue. eLearning removes this barrier. With eLearning, learners do not have to arrange when and where they study. In addition, there is no requirement to attend classes. There is also no need to sit in an uncomfortable room for hours, listening to a boring lecture. Training is more fun. Lessons are interactive. And, you can communicate with learners and tutors in an instant. No Distractions: When it comes to learning, studying in the right environment is important. Within a classroom setting, it can be very distracting and difficult to concentrate. With eLearning you can choose where to work. It can be your home office, the sofa, or even the library. There you can sit and progress through the course material without any distractions. The more focused you are on your learning, the better your learning experience will be. And, the more information you will absorb. Resources No Longer At A Cost: With eLearning all the tools, resources and learning material are based online. This eliminates having to purchase costly resources. This is particularly helpful for businesses. Businesses would have to invest a lot of their budget. They'd have to buy learning materials for staff. With online learning, staff can access the course on their desktop computers. Or, they can use other work issued devices such as mobiles and tablets. This reduces the cost to individuals and to business. A Wide Variety At Your Fingertips: The scope of eLearning is vast. Learners can access a huge range of different courses. They can pick from a number of different subjects, skills and qualifications. Learners can study continuing professional development courses. They can pursue vocational qualifications and even entire degrees. They can pick from diverse subject areas, including engineering and law. With websites such as Alison an Udemy, learners can take short courses on topics such as web design or marketing. They can develop a skill or acquire a basic understanding of almost any subject area. Online One To One Support: Many eLearning courses operate through a virtual learning environment. This is a small online community where learners can participate in discussions with fellow learners. They can also communicate with their course instructor. They can ask questions or submit assignments for evaluation. Tutors are usually available through the virtual learning environments. They can be contacted over the telephone or through an email address. This means that learners can get support or guidance whenever they need it. No doubt about it. eLearning is here for the foreseeable future. As computer ownership expands, eLearning's popularity continues to grow. The reliability of the internet is also improving. As tools and technologies develop, the range and availability of eLearning courses also continues to improve. Technology is transforming the way in which education is delivered. And, the ways in which learners study. Mobile eLearning: Mobile learning is transforming the way in which learning and development is delivered. As Smartphone technology continues to advance, there is no doubt that eLearning will play a key role in the future of training and education. The use of smartphones and apps is a growing trend. These tools, combined with cloud based learning management systems, provide eLearners with a new array of possiblities. Some of the evolving functionality of mobile devices can be used in eLearning as well. Technologies such as GPS tracking, for location based training. Also, camera functionality for uploading work to e-portfolios. And, augmented reality, for delivering a suite of teaching tools. Virtual eLearning (Wearable Technology): Many eLearning providers will create courses which are scenario based. Particularly those which involve practical training. These scenarios reflect the working conditions of an office, restaurant, workshop or healthcare facility. At its most basic level, virtual eLearning can be used to watch how a story unfolds. And, to interact with the environment. Virtual reality techniques can add another helpful dimension to training. They allow eLearning developers to use spectacles or touch sensitive gloves. These can be invaluable enhancements for specific scenarios in training situations. Micro eLearning: The idea behind micro eLearning is simple. Knowledge is exchanged by incorporating micro-learning activities. Small, easy to understand steps within a digital environment are built into the daily routines of an employee. Micro-learning is unlike the conventional approach to eLearning. Micro-learning often adopts push technology and push media. This significantly reduces the cognitive load for learners. Micro-learning involves the exchange of a small snippet of information. This snippet is usually between three and five minutes in length. And, it is designed to meet a specific learning outcome. It is learner focused and scenario based. This lets the learner grasp new concepts and information quickly and effectively. Gamification: Gamification is relatively new to the eLearning world. This is a technique that takes game elements and techniques and combines them with eLearning. This makes the course more fun and engaging for the learner. A strong foundation for gamification relies on a story including a character, a challenge, and a set of events. Creating scenarios is a great way to incorporate narrative elements into the course. Games in eLearning can be used to encourage exploration and discovery. This places a key focus on engaging and stimulating the learner, while also enhancing the overall learning experience. Elearning has advanced considerably over the years. Studying now involves much more than simply listening to classroom based lectures. More than reading through pages and pages of handouts. eLearning providers are constantly developing the experience that they impart to learners. eLearning providers are incorporating more and more interactivity. They are also adopting some of the latest technologies for learners. These include gamification and virtual reality. These approaches increase engagement and enhance the learning experience for learners.